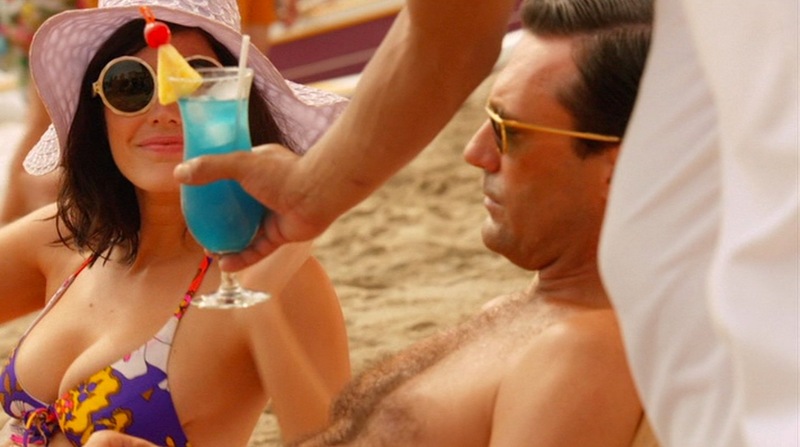 When we first catch up with Don Draper again after the ten-month interseason hiatus, he is in Hawaii on a business vacation, sticking his feet in the sand with his bikini-clad wife Megan. Don sets a good example by packing lightly and rotating through much of the same clothing, ably combining various elements for a different look when needed. He has his everyday resort clothing, but he’s also ready to either hop in the ocean or hop into a wedding party. 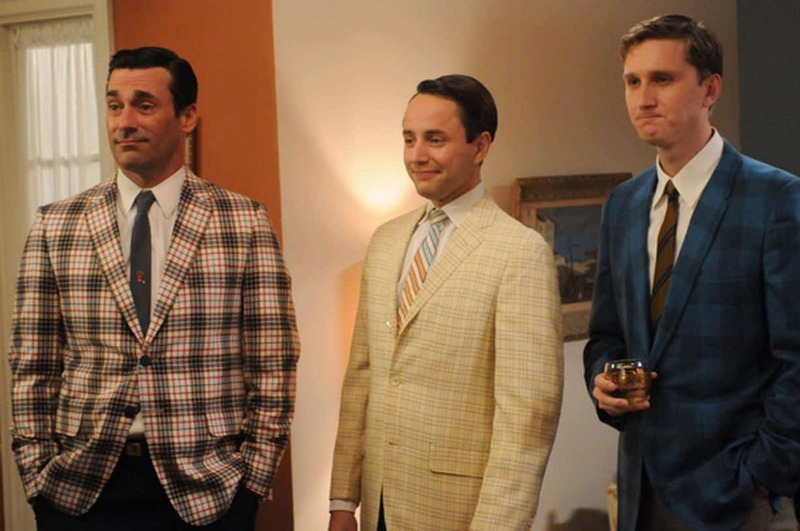 Throughout the seasons, Don has proven to be an advocate of casual checked sport jackets, a trend that began subtly around the fourth season before legions of Mad Men fans went crazy on Twitter over a plaid sportcoat that Megan forced him to wear to a party at the Campbells. 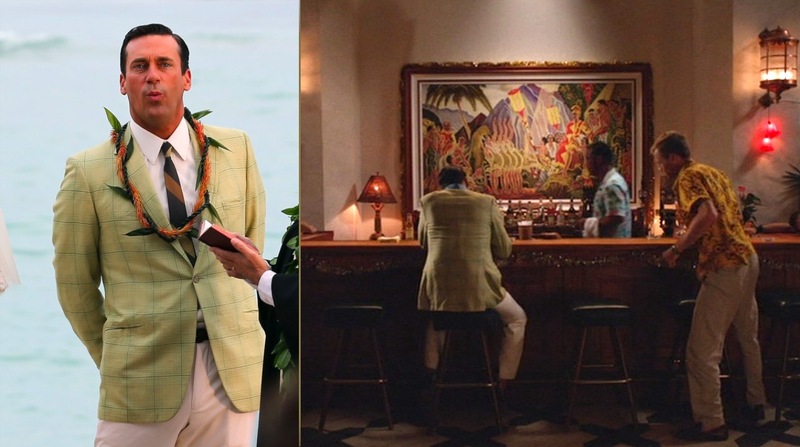 Don’s sportcoat in Hawaii is one of his more subtle jackets, or at least as subtle as a mustard-colored garment can be. Using ImageColorPicker.com and chir.ag, I was able to determine that the most approximate color for Draper’s jacket is actually “Old Gold”. Don turns on the charm. Long-term fans of the show recall that the opening lines of the series way back in the season 1 pilot find Don conversing with a beleaguered bartender about Old Gold cigarettes. After SCDP lost the Lucky Strike account, Don himself switched to Old Gold, and it is Old Gold cigarettes that he is smoking when he meets Private Dinkins in the bar at the Royal Hawaiian in “The Doorway”. Perhaps I’m reading a little too into it, but it seems very coincidental that Don’s jacket color is the same brand of cigarettes he is smoking when he switches lighters with the young private. Given costumer Janie Bryant’s extraordinary attention to detail – both in terms of the era and the narrative – I have a hard time believing that this is mere coincidence. The “old gold” sport jacket has a large brown windowpane overcheck, giving it an additional vintage touch. The buttons are brown faux-wood plastic, with one large button to close in the front and a smaller matching button on each cuff. Draper’s jacket is single-breasted with slim notch lapels that roll to a high button stance. There is a welted breast pocket, and two jetted hip pockets that gently slope toward the rear of the jacket. The shoulders are lightly padded with roped sleeveheads. There are two long double vents in the rear, keeping the jacket as cool as possible in the warm Hawaiian climate. I can’t tell exactly what fabric was used to make the jacket, but it is almost definitely not linen. My best guess would be a lightweight wool like a tropical worsted. A versatile sport jacket is one you can wear to the bar one night and to a beach wedding the next morning. Don wears the same pair of cream trousers throughout the trip, whether with a casual shirt or a tie. They have a low rise and flat front with side pockets and a short break. Don wears them with a slim black leather belt. Don’s casual shirt for the trip is a blue Hawaiian shirt with a white floral pattern permeating throughout. It is a very distinctive shirt with blue triangles up and down both the right and left panels. The short-sleeve shirt buttons down a placket-less front and has slim camp collars and a straight hem across the bottom. The main photo is taken from Megan’s slideshow that she uses to entertain the neighbors on New Year’s Eve. 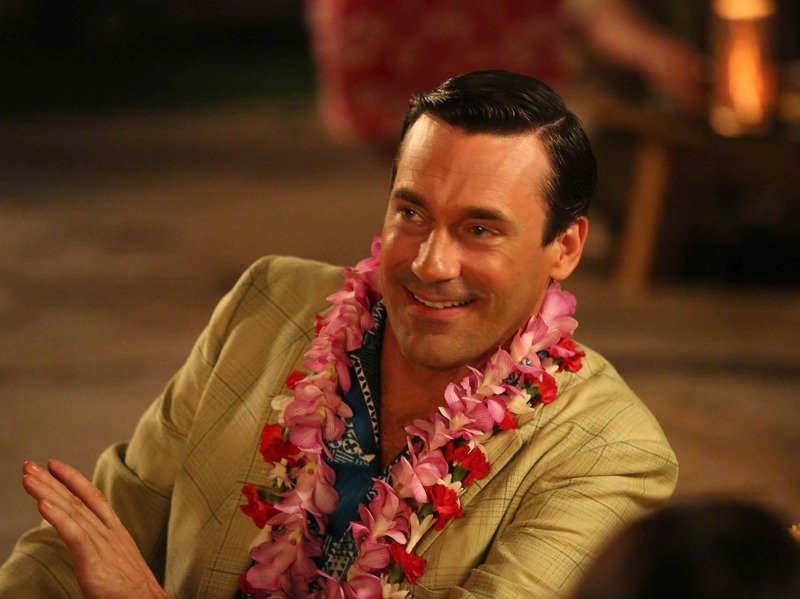 The inset photo of Jon Hamm smiling (which would be very out of character for Don, even on vacation!) 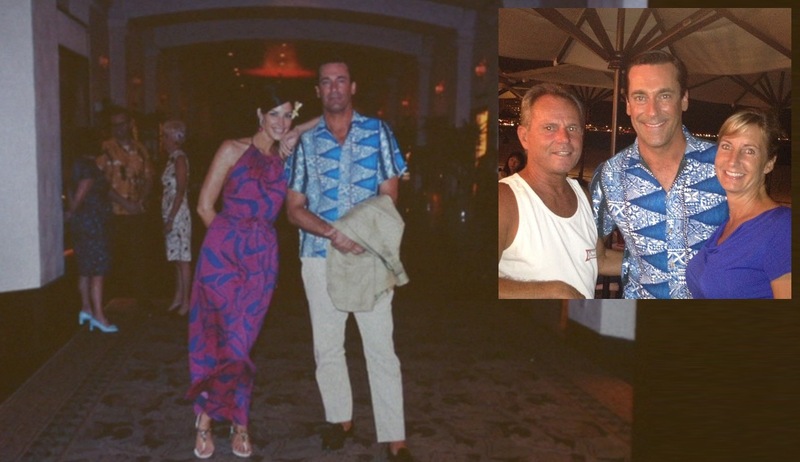 is taken from On Location Vacations, where a man and woman managed to get a photo with Hamm during the filming of the episode in Hawaii. 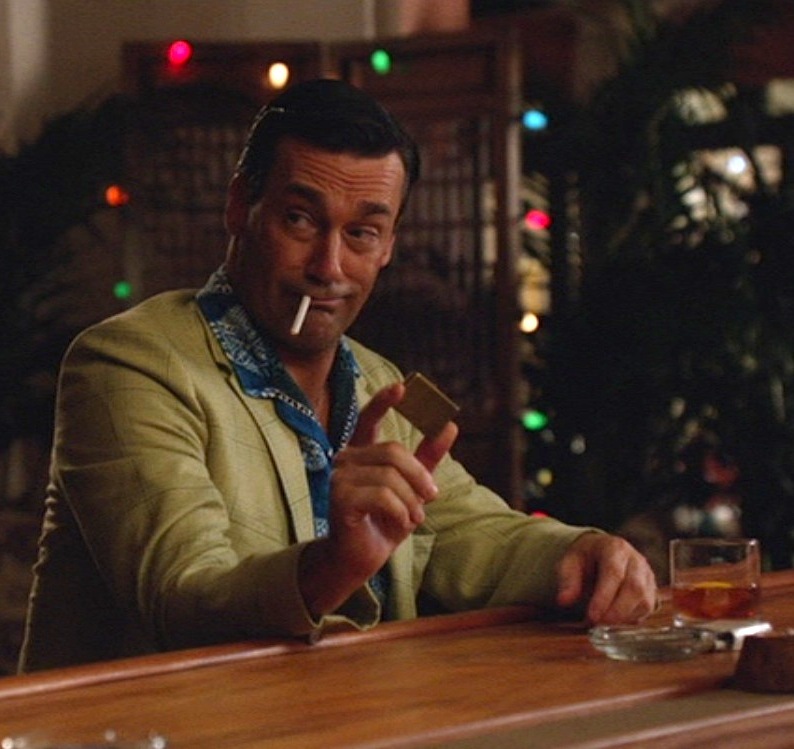 It’s interesting – to me at least – that Don’s jacket is “old gold” (his cigarette brand) and his shirt is a “blue Hawaiian” (the cocktail Megan drinks at the beach). Just a few years earlier, he was smoking a different brand of cigarettes and married to a different woman. While this sport jacket and floral shirt are certainly a different look for Don, are they also highlighting the ways his life has changed since we first met him in 1960? For his impromptu role as Private Dinkins’ best man in his beach wedding, Don throws on a crisp white shirt and a narrow striped tie. The wide olive and tan block tie stripes follow the American direction of right-down-to-left. All that can be determined about the shirt is that it has a front placket and much less of a spread than the dress shirts we’ve seen hiim wear before. The white cuffs poke out from the jacket in behind-the-scenes photos, but not enough to determine with certainty if it has button cuffs or his usual double/French cuffs. 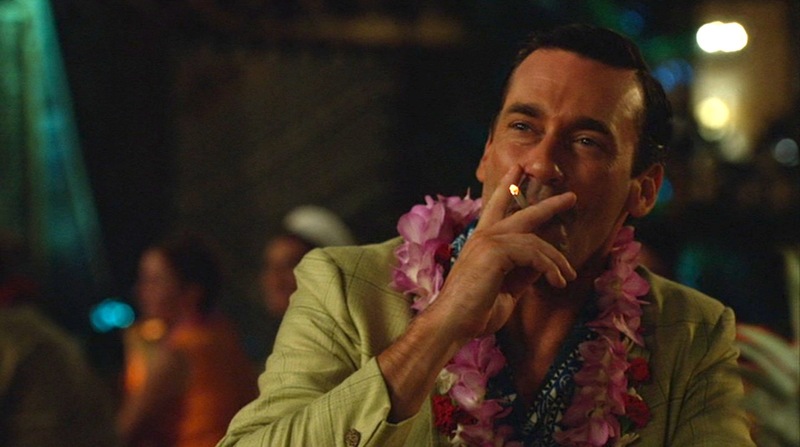 You’d expect Don Draper to get lei’d during a wedding ceremony, wouldn’t you? His shoes throughout the trip are a pair of black leather tasseled slip-on loafers, worn without socks. Although it’s not as important with an outfit like this, Don properly matches the shoes to his black leather belt. Hamm and Paré on location in October 2012. 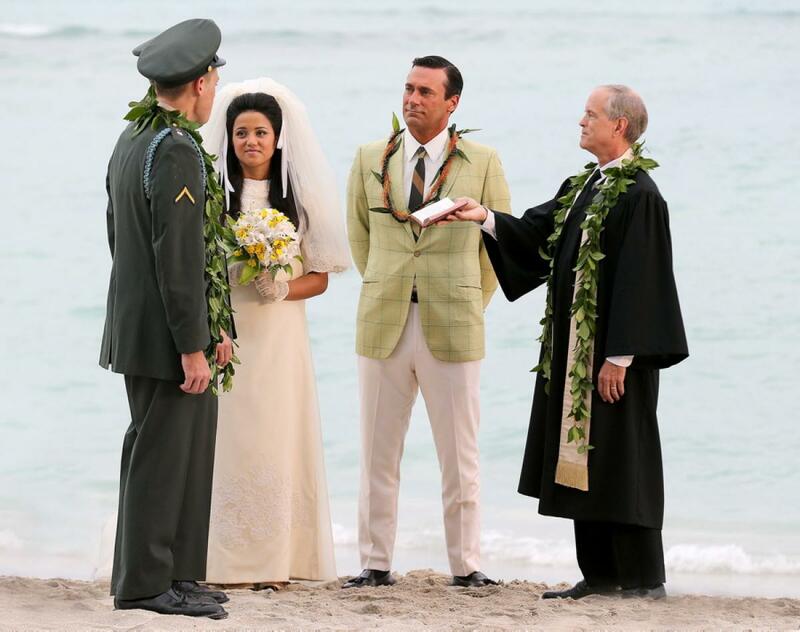 During the anticipation for the sixth season, dozens of pictures began flying up across the Internet after Jon Hamm and Jessica Paré were spotted filming on a warm Hawaiian beach in October 2012. Once everyone’s eyes – male and female alike – were finished ogling Paré’s beach body, people began to notice Draper’s era-correct beachwear. While it sounds simple to just find a vintage pair of swimming trunks and sunglasses for a man, Bryant and her team did a fantastic job of finding exactly what Draper (and Mrs. Draper) would have worn on a beach for a 1967 vacation. Don’s swimming trunks are red with a relatively short inseam, especially by modern standards, and a white-accented pattern of starfish and other sea creatures. They are very simple-fitting with only an elastic waistband and surprisingly large on-seam side pockets. There is also a small coin pocket on the right side that closes with a buttoning flap. The button appears to be another brown plastic faux-wood button similar to those on the jacket. 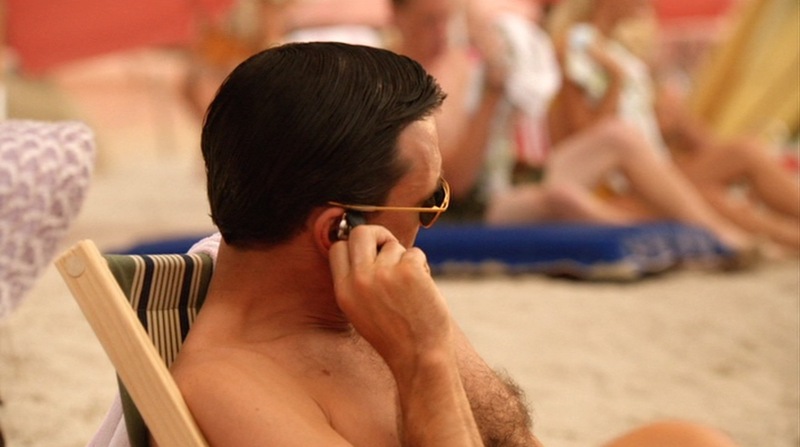 We don’t even technically see Don’s swimwear on screen (I don’t think), but behind-the-scenes photos and production images provide enough detail. A very Draper-esque pair of similar swim trunks from the ’50s are available from ScootersShop on Etsy. Some of the details are different, such as a white drawstring, but wearing these to the beach would certainly spur thoughts of Don Draper. I don’t know about you, but I wouldn’t mind people mistaking me for Jon Hamm. The Etsy swimming trunks are made from barkcloth, a soft but thick fabric made from Moraceae tree bark that was very popular from the 1940s through the 1960s. Another piece of costuming that got plenty of attention are Don’s sunglasses, which have been identified as a vintage pair of gold rectangular-framed Ray-Ban Olympians with wide dark green lenses. No Kindle needed when the words are already printed on physical pieces of paper! Previously, Don had always worn his American Optical military aviators, and these bright gold Ray-Bans mark a change in the direction of keeping up with the trends of the late ’60s. Whether Megan bought him the sunglasses or he just sat on his old ones and needed a new pair, the shades got plenty of attention from fans. Although Ray-Ban discontinued the Olympian model, Old Focals responded to the spike in demand and developed their own version of “Drapers” with the curved gold metal frames and green glass lenses. Old Focals gives the following specs for the glasses: 5.75 inch total front width with lenses that are 2.5 inches wide and 1.5 inches tall. Returning from the fifth season is Don’s luxury watch, an Omega Seamaster Deville with a stainless 34 mm case, black textured crocodile strap, and a black dial with a date indicator at 3:00. The Son of Archie, taking orders from his watch before killing his next victim. Don’s final accessory is one that never even shows up in the final cut of the episode but shows just how far the production team goes to create mise en scène, if only for the actors’ benefit. 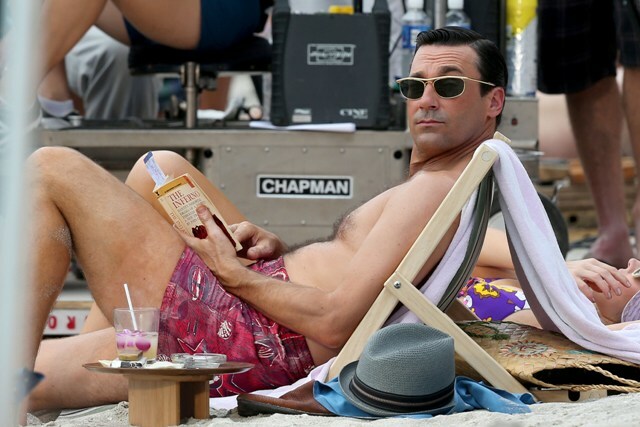 Production photos show Hamm relaxing on set and reading The Inferno with a gray paper fedora next to him with a black striped band. The hat has a very short brim and a high crown. Can anyone identify the cloudy cocktail he’s drinking? Given the cherries, it might be a whiskey sour. The hat is resting on a pair of well-worn brown leather loafers and a blue garment (a shirt? ), which I suppose we should also assume he wore to the beach. 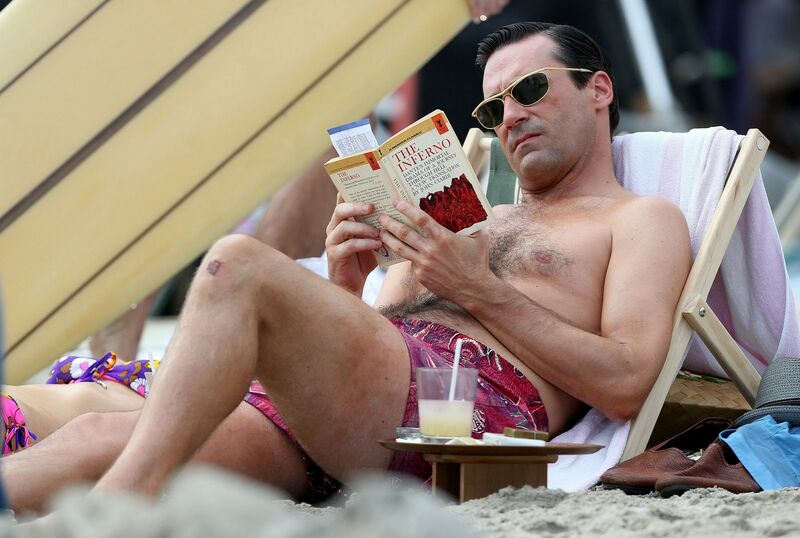 As you’ve doubtlessly seen a few times above, Don’s choice for beach reading is Inferno, Dante’s 14th-century bestseller and the first part of his epic Divine Comedy. While some people prefer something lighter – at least lighter than a journey through hell – no beach vacation for me is complete without a bag full of books. Reading books at the beach is a lost art with the new wave of technology taking over. Make the death of all those trees worthwhile and take your dog-eared copy of an old favorite down into the sand. 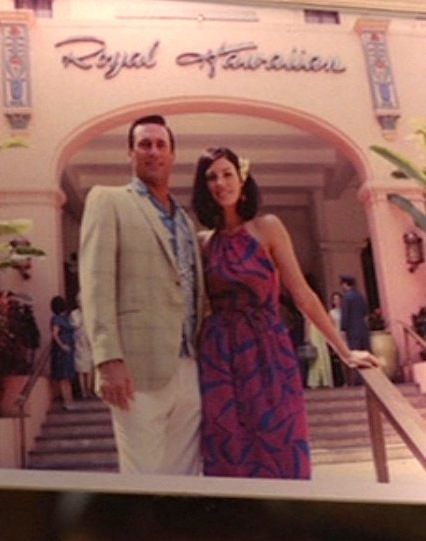 Don and Megan stay at the Royal Hawaiian Hotel, owned by SCDP client Sheraton (as it was in real life). The Royal Hawaiian, also known as the “Pink Palace of the Pacific”, is considered to be a flagship hotel for Hawaii and was one of the first built in Waikiki. It opened in February 1927 with a black tie gala and instantly became the Pacific mainstay for the upper class, ranging from statesmen to Hollywood stars. Even FDR had stayed at the Royal Hawaiian during the Depression. Once World War II began, the Royal Hawaiian opened its doors to the many U.S. servicemen fighting in the Pacific, and it continued servicing the military with the “Concert by the Sea” broadcast over the Armed Forces Radio Network (AFN). Private Dinkins is an example of the many real-life U.S. servicemen who would visit the Royal Hawaiian for R&R. Although it briefly closed for a major renovation six years ago, the Royal Hawaiian is still thriving, currently boasting 528 guest rooms and 34 suites. The end credits of the “The Doorway” feature Elvis Presley’s recording of “Hawaiian Wedding Song (Ke Kali Nei Au)”. The song was originally written in 1926 for Charles E. King’s operetta, Prince of Hawaii, but Andy Williams’ 1959 version became a #1 hit and revived the song in pop culture. Two years later, Elvis recorded it for his film Blue Hawaii. 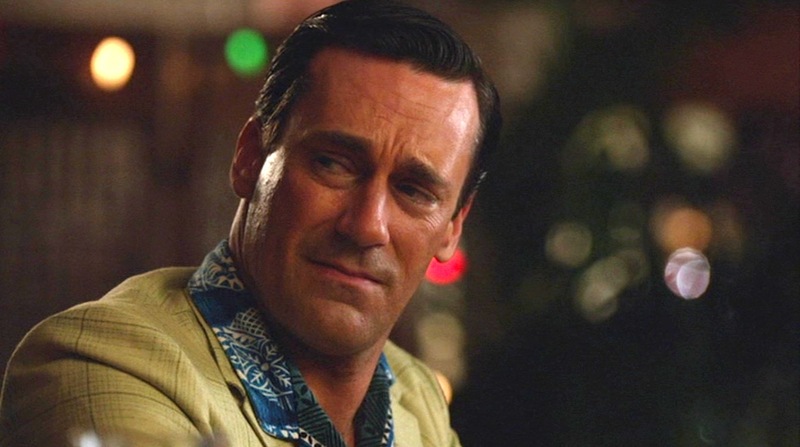 The song’s use in this episode of Mad Men is especially appropriate since Don was in Hawaiian wedding, but I’m sure you didn’t need me to tell you that. Don doesn’t really surprise us here, sticking to his Old Fashioneds while passing the time at the hotel bar. 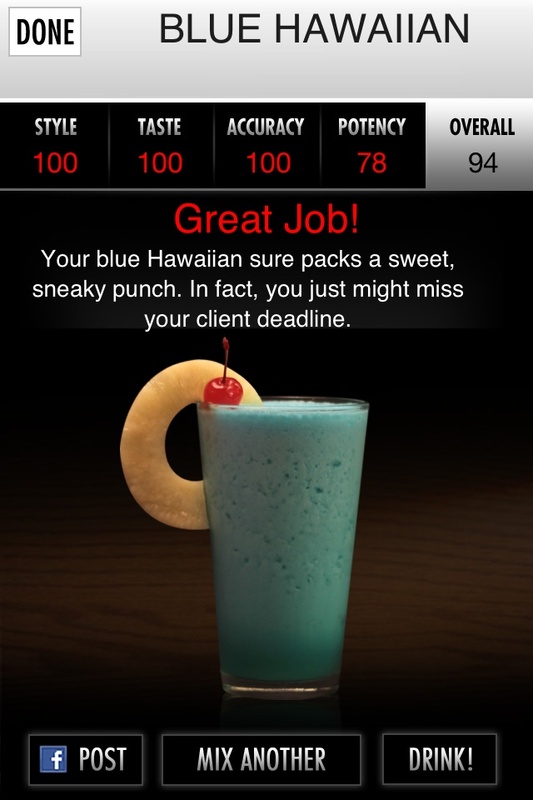 Megan, however, orders several Blue Hawaiian cocktails while down at the beach. In Hawaii, it’s certainly okay to do as the Hawaiians do, especially if that entails drinking delicious cocktails. It’s not like you’d drink it anywhere else. Once you’ve got all that, the drink is ridiculously easy to make. Pour the ice into a blender, then pour all of the ingredients – the Curacao, the rum, the cream of coconut, and the pineapple juice – and blend the hell out of it. Once you’ve done that, pour it into a hurricane glass (like the one Megan is holding, not the highball glass used in the app) and garnish with a cherry or two and a slice of pineapple. There is a difference between the Blue Hawaiian (this drink, which uses creme of coconut) and the Blue Hawaii (which uses sweet and sour mix). Some folks even add vodka to a Blue Hawaii, which I’ve never heard of with the Blue Hawaiian, but it sounds pretty awesome. Go for it, kids. There are very few times when it’s OK to wear a Hawaiian shirt, but a Hawaiian vacation is the top reason. Don does it with class, pairing it with a sportcoat and slacks instead of cargo shorts and a fanny pack. And if you’re actually in Hawaii, there’s no shame in wearing a lei! Check out the sixth season. 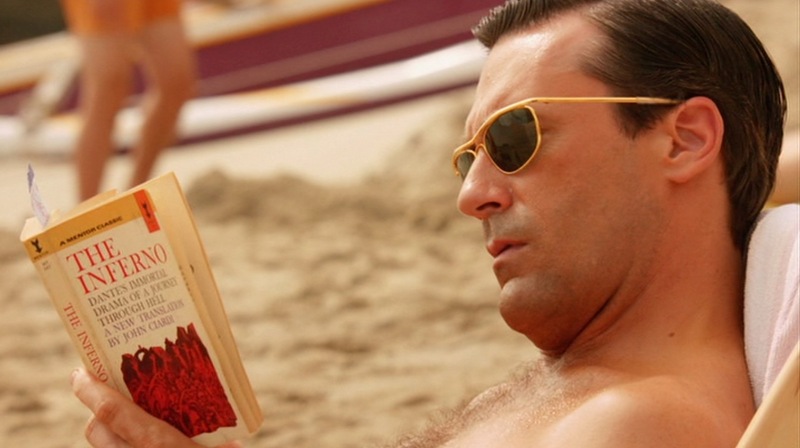 And if you’re going to the beach, you can channel Don Draper by choosing Dante’s Inferno for your summer reading. I think it’s possible the drink is a Mai Tai, and that the garnish is actually a flower. Tiki drinks, particularly that one, became very popular around the ’60s, and I believe the Mai Tai appeared in the film “Blue Hawaiian” — which would link it nicely to Megan’s drink. Depending on how it’s made, a Mai Tai can appear cloudy like that. Looks to be a light blue self collar polo and the shoes are brown hurraches.